Pastalina’s is a neighborhood red sauce Italian restaurant in Medford. Steve has been running a lot of races lately and his go-to meal the night before is chicken, broccoli and ziti (usually from Bob’s in Medford). We had a 7pm reservation but the table was not ready when we arrived. It took 20 minutes to get seated and we were given a basket of dry Italian bread and olive oil and garlic for dipping. We were grateful for the bread later, when it took 30 minutes for our salad to arrive and then another 30 minutes for the entrees. We shared a large house salad ($8) to start. It was a generous, but pedestrian affair of iceberg, pale tomatoes, green peppers and canned olives. 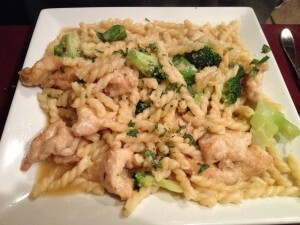 Steve had his requisite chicken and broccoli dish ($17), but opted for homemade fusilli, instead of ziti. 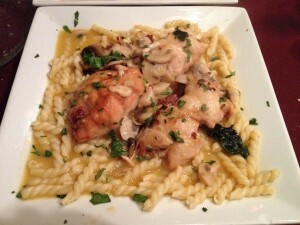 I had the chicken Saltimbocca ($18) with the homemade fusilli, as well. My chicken was stuffed with prosciutto and was not over cooked, but the mushroom marsala sauce was strangely saccharin. I think Steve’s simple garlic and oil sauce was better. The pasta itself was great and worth the $3 upgrade from the boxed stuff. It took another 25 minutes to get our check, making it a 2 hour, 2 course meal. Pastalina’s is BYOB, which is a good thing, as you would probably never get your drink if you were depending on your server to bring it to you.